Paul M. Donigan (1862 - 1930) came to the United States about 1890 to attend medical school. The presence of relative in this area brought him to Brookshire. In 1910, Dr. Donigan built this home for his wife, Rebecca. The main floor was on the second level, while the lower floor served as a cellar and Donigan's medical office. The pyramidal roof house features a wraparound porch with neoclassical influences. Recorded Texas Historic Landmark - 1985. A lot has changed since the first Armenians settled in Texas in the 1880's. The horse and buggy is gone, electricity has replaced the kerosene lamp and country sheriffs no longer run for office on "I shoot to kill" slogans. Newcomers today arrive into an established "community," but back then Texas was a "new frontier," unknown to most Americans, and even less to Armenians half a world away, whose only knowledge of the New World was based on what they had heard from American missionaries roaming Asia Minor. The year was 1882 - when the ship from the Old World arrived at Ellis Island, New York, brining 54-year-old Khatchadoor Donigian, his brother, his two nephews, his wife Mary and their five children, to start a new life thousands of miles away from the Ottoman Empire. Back home, in the small town of Geyve, east of what was then Constantinople, Khatchadoor Donigian had grown silkworms and made silk for a living. He was a prosperous man, but this was New York, a large city better known for its "sweat shops" rather than the open prairies and farmland Khatchadoor Donigian had left behind. He was careful with the 10,000 dollars in gold he brought with him - maybe because no one in his family spoke English or because he was unsure of earning more in America. But regardless of reasons, he decided that New York was not for him. People spoke of Texas, where settlers were needed to farm that land - an appealing thought for a man with a rural background. After a brief stay in the New York area, the Donigian clan was on the move again - to Galveston, Texas, by ship and then inland by mule wagon to Harrisburg, then to Houston and finally the Settegast Ranch in Fort Bend County - a previously settled ranch which Donigian purchased. Here the Donigians engaged in primitive farming. For food, they used mostly wild life and farm-grown produce. At least one nephew, Horn Donigian, was a cowboy in his early days, moving cattle from Texas to Kansas. When the Spanish American War broke out, he joined the legendary Rough Riders under Teddy Roosevelt and fought in Cuba. Medical care was far away, and during their first year on the ranch, Mary Donigian - the mother of the neighborless Armenian immigrant family - died, leaving behind daughters Rosa and Anna to look after the housekeeping and cooking, while brothers Peter, John and Vartanes did the farming. The men hauled their cash crops into Houston by horse drawn wagons. They sold cotton, pecans, and a few animal hides. But farming was too limited for Khatchadoor Donigian - whose name was already being spelled Hachador Donigan, because it was easier to pronounce. Selling the plantation, Donigan moved the family to Pattison in 1886 to begin a new venture closer to his heart. In a short while Donigan Sr. and his sons had purchased their first cotton gin and corn mill in Pattison, thus establishing the Donigan family in the cotton ginning business which continued for generations to come. One of the last Donigan gins in nearby Brookshire - complete with most of its early equipment - has been renovated and serves as a restaurant today. The Donigan success story and letters of "the good life in America" went back and forth across the Atlantic, attracting more relatives and other Armenian friends to Pattison and Brookshire in Waller County - the cornerstone of the Armenian community in Texas. Unfortunately, the Waller County's 1890 census was burned in a fire, but records from the 1900 census show that at the start of the new century, there were 29 Armenians from Turkey and 15 "Armenians born of Armenian parents." 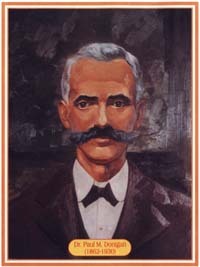 Khatchadoor Donigian died in 1900. But the seeds of the Armenian community were planted in Pattison and nearby Brookshire - small towns in Waller County on the outskirts of Houston. For generations, the Donigan (born Donigian), Agopian, and Harrison (born Gureghian) families played key roles in the development of the region. Except for two Hovas brothers who still live near Pattison, an area of vast plantations but a recorded population of 318, lists Armenians under almost every profession. There is Armenak Agopian, whose 47 year career in banking included eight years as Executive Vice-President of the Farmer's State Bank. A special section on the "Brookshire Pioneers" lists Vartan Manasseh Donigan, "an Armenian, proud of his ancestry . . . (who) is satisfied that his is one of the best places for them to settle, as a good living and riches await them, as they are, as a class, frugal, industrious and temperate." The same section also lists Zira (Zareh) Donigan, and refers to him as "the efficient manager of the Brookshire Mercantile Company," "a leader and a prize for any town," and George Harrison - born Gureghian in 1875 in Kharpert who arrived in the United States in 1890 with only 25 cents in his pocket. Harrison, like others of his generations, spoke no English, but that was no handicap for the teenager who moved from one job to another until deciding on Texas as his home. His employer advised him to buy a gun, which he did, when he arrived in Pattison, Texas, around 1895 from Waukegan, Illinois where he was making five dollars a week in a steel factory. The 20-year-old bachelor was soon to get married to Rosa, the daughter of Armenian immigrants from Dikranakert, Turkey, and have six sons - each a different success story in itself. Among them were merchants, bankers and at least two oilmen - Sam and Leon. There are no more Donigans in Waller County, but the home of one prominent member of the clan, that of Dr. Paul M. Donigan who died in 1930 - stands as a historical museum in Brookshire, which makes no reference to the Armenian ancestry of its original occupant. "We have to do something about this," says Ed Hovas, a true Brookshire Armenian who remembers growing up in a town where "people went around carrying guns." He also remembers a county sheriff running for office on a slogan proudly declaring that "when I shoot, I shoot to kill," and "the small 150-strong Armenian community that got together to collect money for the victims of the Armenian Genocide." "We had no church but sometimes priests visited from Fresno. We had very little communication with the rest of the world, but we sometimes received Armenian newspapers from the East. That's how we kept track of what was happening," he said. At 86, Ed Hovas still drives out of town visitors around, showing them the "Armenian historical towns" around Pattison and Brookshire like the old store fronts with Armenian names, the Dr. Donigan Museum, the old Donigan cotton gin, and the Methodist cemetery on the outskirts of a town "whose population has not gone much above 300." "This place has not changed since my childhood," Hovas says. At the cemetery, the faded old tombstones tell the story of the early Armenian pioneers of Texas, who paved a small path for others to follow.